Caring for adults with special needs presents a number of challenges. In 2015, the U.S. Census Bureau reported that more than ten million people over the age of 65 had difficulty walking or climbing stairs, and 7.5 million adults had difficulty bathing or dressing. Needs vary based on the circumstances and physical abilities of the individual, and assisted living or other adult care facilities may not always provide the type or quality of services needed. That’s why many families choose home care instead. Most senior adults with disabilities prefer to maintain their independence for as long as possible, and home care can provide them with many benefits like companionship, improved quality of life, and customized services. Companion care services keep seniors engaged with their hobbies, interests, and communities while giving them essential social interaction. Caregivers may play games, read, attend religious services, or participate in a favorite hobby with your family member, preventing feelings of loneliness or isolation that can often result from living alone. If your family member struggles with everyday activities like remembering to take medication or getting into and out of chairs, personal assistance services can offer the helping hand he or she needs. These services include medication reminders, transportation to medical appointments, dietary monitoring, and mobility assistance. These needs can be enough to prevent your loved one from being safe and healthy on their own. 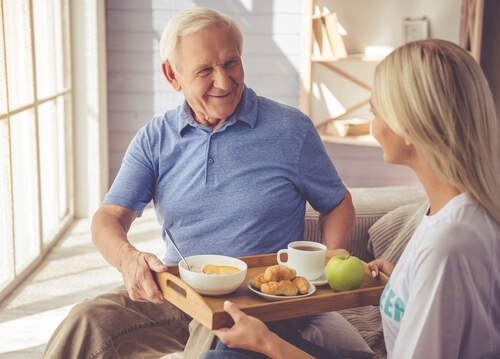 In-home care gives them the option of remaining in the comfort of home while receiving the assistance they need to prevent health and safety concerns. Sometimes, your family member’s physical needs make it difficult for them to do things like washing their hair or getting dressed in the morning. Personal care services offer your loved one the extra care needed to meet those needs with services tailored to his or her unique circumstances. In-home caregivers can help with bathing, washing hair, toileting, incontinence care, getting dressed, and more. Every family and every individual has different needs based on the physical abilities or disabilities present. That’s why in-home services should be customized to meet the unique needs of your family member Personalized caregiving helps seniors maintain their dignity and independence and gives family members peace of mind about safety and health concerns. To learn more about choosing the right care agency, download our FREE Guide.